There have been angry scenes in Dewsbury as a 19 year old man, charged with sending grossly offensive messages on Facebook after the death of six soldiers in Afghanistan a fortnight ago, appeared at the Magistrates Court. A 50 strong group of far right demonstrators shouted chants at supporters of the teenager as they left court. Dozens of police set up a security cordon to keep members of the EDL away from those who’d been attending court. 19 year old Azhar Ahmed appeared before magistrates for the first time accused of posting grossly offensive comments on Facebook two days after the deaths of the six soldiers. The six, five from the Yorkshire Regiment and one from the Duke of Lancaster’s Regiment, are being repatriated today after they were killed in a Taliban bomb blast on March 6th. Ahmed, whose address was given as Fir Avenue, Ravensthorpe, Dewsbury, pleaded not guilty to the charge and was given unconditional bail. He’ll stand trial at Huddersfield Magistrates Court in July. It’s thought he slipped out of court after the hearing avoiding the crowd that had gathered outside. 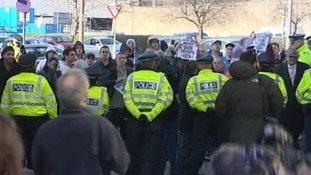 Sporadic protests continued throughout Dewsbury town centre in the hour after the hearing. Police are maintaining a heavy presence in the area.